The CoffeeShop Blog: CoffeeShop Painted Borders Free Action! CoffeeShop Painted Borders Free Action! Here is the newest free action from the CoffeeShop, the CoffeeShop Painted Borders. 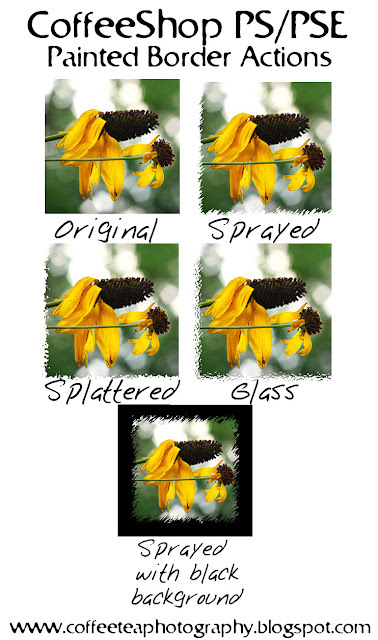 It applies 3 completely adjustable "painted" border effects on your photo with a white background. You just click on the one you like best. You can also change the background to match your storyboards or websites. The results are more dramatic on lower resolution images, but it also works on high resolution images. CoffeeShop Painted Borders runs in Photoshop 7 and above and Elements 6 (let me know if it works in 4, 5, & 7). Thanks again for sharing your actions, and tutorials. It helps lots of folks, and I think that's pretty darn cool! Cool action. Thanks for sharing! Love your new blog! Can't wait to try these out. thank you , thank you, thank you....can't say it enough. thanks for sharing the actions! your photography shots make the everyday look sensational. Thanks so much for this set of actions! I'm dying to try them. I use both PSE 5 and 6, so I'll see if they work in 5. Thank you so much for sharing your actions. I think they are absolutely awesome and it is wonderful of you to share them with everyone. I can't wait to try the new borders. Thank you very much! I can't wait to try this! Nice borders! Thanks for the action! Rita!!! Yeah! I discovered your blog thru Flickr. I just got the PS CS3 and have begun downloading actions and trying them out. Oh my what an addiction this can (and has)become! Your blog is fun and how very wonderful of you to be sharing all this hard work you do. I'll be looking forward to seeing what you do with the storyboard, I'm not familiar with it all that much, but should be fun! Thanks again! I love all of your actions. I absolutely LOVE your actions and am so grateful that you are letting us download them for free! I am currently using Photoshop Elements 5 and have had no problems with most of the actions... except I can't seem to get these painted boarders to work. The action runs, I see the three options for the boarders, but I can't seem to apply the boarder to the photo! I love this action too. However I'm using PSE 5 as well and can't get it to work. It runs but I get a window that says "The object layer "Layer 2" is not currently avaliable" and I don't see the results at the end? Is there someting I am missing??? To apply the border you need to click on the eyeball by the border you want (it is the little eye icon to the right of the layer). Turn on the one you want to see! And make sure you start with a flatted image or the action will not work. I've tried what you said and still get a Window that says "The command "Layer Via Copy is not currently available." if I click continue I see the instructions for the edge, then a window "The object "layer"Layer 2" is not currently available. I get the same errors as "anonymous" above. Any hints? I just found your blog and I'm excited to give this action a try. I guess I am a dork, but I can't get it to work. I download it and all I get are pictures. No instructions or anything. I need help! Can anyone help me? Thanks, I can't wait to use these on the photos from my photo shoot!